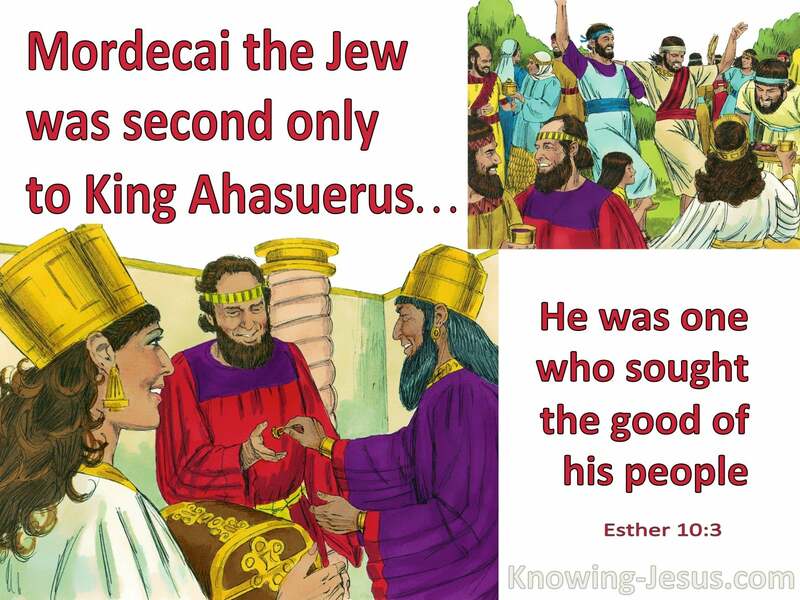 For Mordecai the Jew was second only to King Ahasuerus, and great among the Jews and in favor with his many kinsmen, one who sought the good of his people and one who spoke for the welfare of his whole nation. When will the Lord's people, who have the Scriptures and who know the Scriptures so well in the letter, when will they come to realize and to recognize that if truly they have been crucified with Christ, if they have died in His death and have been raised together with Him and have received the Spirit, they have Light in their dwelling? "The anointing which ye received of Him abideth in you, and ye need not that any one teach you, but... His anointing teacheth you concerning all things" (1 John 2:27). When will believers, when will Christians, come to realize that? Why must Christians who have the knowledge of the Scriptures in the letter, run about here and there to seek advice from others on matters which vitally affect their own spiritual knowledge? I do not mean that it is wrong to get counsel, wrong to know what other children of God of experience think or feel about matters. But if we are going to build our position upon their conclusions, we are in great danger. The final authority and arbiter in all matters is the Spirit of God, the Spirit of the anointing. We may get help from one another, but I do hope that you are not going to build your position upon what I say now because I say it. Do not do that. I do not want you to do it. I do not ask you to do it. What I say is: listen, take note; and then go to your final authority Who is in you if you are a child of God, and ask Him to corroborate the truth or to show you otherwise. That is your right, your birthright, the birthright of every child of God: to be in the light of the indwelling Spirit of Light, the Spirit of God. The lamp of the body is the eye. Therefore, when your eye is good, your whole body also is full of light. The natural man does not receive the things of the Spirit of God, for they are foolishness to him; nor can he know them, because they are spiritually discerned. Open my eyes, that I may see wondrous things from Your law. I am the light of the world. He who follows Me shall not walk in darkness, but have the light of life. § We all, with unveiled face, beholding as in a mirror the glory of the Lord, are being transformed into the same image … just as by the Spirit of the Lord. It is the God who commanded light to shine out of darkness, who has shone in our hearts to give the light of the knowledge of the glory of God in the face of Jesus Christ. The God of our Lord Jesus Christ, the Father of glory … give to you the spirit of wisdom and revelation in the knowledge of Him … that you may know what is the hope of His calling, what are the riches of the glory of His inheritance in the saints. He struck the rock, so that the waters gushed out, and the streams overflowed. All our fathers were under the cloud, all passed through the sea, all were baptized into Moses in the cloud and in the sea, all ate the same spiritual food, and all drank the same spiritual drink. For they drank of that spiritual Rock that followed them, and that Rock was Christ. § One of the soldiers pierced His side with a spear, and immediately blood and water came out. § He was wounded for our transgressions, He was bruised for our iniquities; the chastisement for our peace was upon Him, and by His stripes we are healed. But you are not willing to come to Me that you may have life. § My people have committed two evils: they have forsaken Me, the fountain of living waters, and hewn themselves cisterns—broken cisterns that can hold no water. If anyone thirsts, let him come to Me and drink. § Let him who thirsts come. Whoever desires, let him take the water of life freely. The Lord will perfect that which concerneth me" (Ps. 138:8). After the believer enters into life by faith, he wonders why it was so difficult for him to see that it was all of grace - the humble reception of a finished work. And yet he goes through the faithless struggle once again before he sees that his daily Christian life is also a finished work - complete in Christ. God is faithful, by whom ye were called unto fellowship of His Son Jesus Christ our Lord' (1 Cor. 1:9). What believers need is the simple faith that the establishing in Christ, day by day, is God's work - a work that He delights to do, in spite of all our weakness and unfaithfulness, if we will but trust Him for it. To the blessedness of such faith, and the experience it brings, many can testify. What peace and rest, to know that there is a Husbandman who cares for the branch, to see that it grows stronger; who watches over every hindrance and danger, who supplies every needed aid! "What peace and rest, fully and finally to give up our abiding into the care of the Father, and never have a wish or thought, never to offer a prayer or engage in an exercise connected with it, without first having the glad remembrance that what we do is only the manifestation of what our Father is doing in us! The establishing in Christ is His work: He accomplishes it by stirring us to watch, and wait, and work." -A.M.
"Now He which stablisheth us with you in Christ, . . . is God" (2 Cor. 1:21). The people of God in Isaiah's day had starved their imagination by looking on the face of idols, and Isaiah made them look up at the heavenlies, that is, he made them begin to use their imagination aright. Nature to a saint is sacramental. If we are children of God, we have a tremendous treasure in Nature. In every wind that blows, in every night and day of the year, in every sign of the sky, in every blossoming and in every withering of the earth, there is a real coming of God to us if we will simply use our starved imagination to realize it. The test of spiritual concentration is bringing the imagination into captivity. Is your imagination looking on the face of an idol? Is the idol yourself? Your work? Your conception of what a worker should be? Your experience of salvation and sanctification? Then your imagination of God is starved, and when you are up against difficulties you have no power, you can only endure in darkness. If your imagination is starved, do not look back on your own experience; it is God Whom you need. Go right out of yourself, away from the face of your idols, away from everything that has been starving your imagination. Rouse yourself, take the gibe that Isaiah gave the people, and deliberately turn your imagination to God. One of the reasons of stultification in prayer is that there is no imagination, no power of putting ourselves deliberately before God. We have to learn how to be broken bread and poured out wine on the line of intercession more than on the line of personal contact. Imagination is the power God gives a saint to posit himself out of himself into relationships he never was in. The Lord turned the captivity of Job. How many believe that this is the end of the story of Job. The truth is that this is right at the beginning.. the start of God’s plan. A plan conceived in eternity past.. a plan involving spiritual war that will continue through centuries. A plan that will continue on until all things are consummated in Christ. A plan you and I are part of. A plan to bring forth the eternal fullness of Christ. The battle of all ages will end when Christ is all and in all. Chronologically.. Job is one of the oldest books in the Bible. Typologically.. Job is the most complete ‘type‘ of the church age believer, and its poetic form demonstrates God’s dealings with the innermost being of man. Other than the deep sufferings of Christ, Who alone is worthy, Job’s experience, suffering, purging and ultimate understanding stands alone – for this is the most detailed records of one of God’s servants in Scripture. Many only see Job as God’s upright servant, who got caught up in spiritual warfare. Oh but there are so many deeper truths that need to be explored for our learning. Prayer and intercession – praise and chastening are all pivotal cogs in this story. Peter informs us in his letter to the believing church that the eyes of the Lord are over the righteous.. His ears are open to their prayer – but the face of the Lord is against them (that is believers)… but the face of the Lord is against them that do evil. This is not evil in the worldly sense – but relates to anything that is not of Christ. Action or attitude in a believer, stemming from the old sin nature needs correction – like Job’s self-righteousness… his wife’s defeat…his friends critical religiosity.